Potential Current Option: HughesNet Gen 5. As of August 2017, HughesNet Gen4 "Jupiter" service is no longer available for new customers. HughesNet Gen3 "Spaceway" remained available for new customers until Fall 2017, but only for customers who absolutely needed a static IP address. Once static IP addresses were available for Gen5, Gen3 no longer allowed for new customers either. Our guide to the older service tiers is archived below. Spot beam services in the past have not supported mobile users, but that is changing. Traditionally – consumer-grade spot beam satellite services have been strictly limited to fixed installations. Even if you were physically able to move and successfully re-aim a dish, the satellites would refuse to acknowledge you at your new location if you ventured out of your assigned "spot" on the satellite's coverage map. Policies however are evolving – and HughesNet began quietly running a trial program in 2015 coordinated by commercial reseller Real Time Communications that for the first time enables an affordable spot beam satellite service to be provisioned to automatically change spots. Even more surprising – you do not need an expensive auto-aiming roof-mounted dish to do so – manually aimed tripod-mounted satellite internet setups are fully supported, with everything you need to get connected costing roughly around $1000. 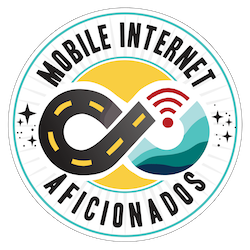 This once again opens the door to affordable satellite internet on the go - if you are OK with the realities of needing to set up and tear down a complicated tripod setup everywhere that you want to get connected. But as usual with HughesNet, things remain particularly complicated for mobile users. Gen3 "Spaceway" vs Gen4 "Jupiter"
Spaceway covers the entire continental USA, but Jupiter service (currently) leaves a huge chunk of the country without service. As of the end of 2016, HughesNet has two spot beam satellite systems currently deployed - third generation "Spaceway" which first launched in 2007, and fourth generation "Jupiter" which first began rolling out in 2011. Both of these can now be "mobilized" to automatically change spots. The older Spaceway satellite provides coast-to-coast coverage with speeds maxing out around 5Mbps down, and 1Mbps up. The newer Gen4 Jupiter system is substantially faster - with speeds as fast as 15Mbps down and 2Mbps up on offer. And because there is more capacity in the system - there are larger monthly data buckets available. These may seem slow and limited by LTE cellular standards, but for satellite these speeds are very decent. The major downside of “Jupiter” Gen4 service is that it does not have nationwide coverage - making it of limited interest to many RVers. 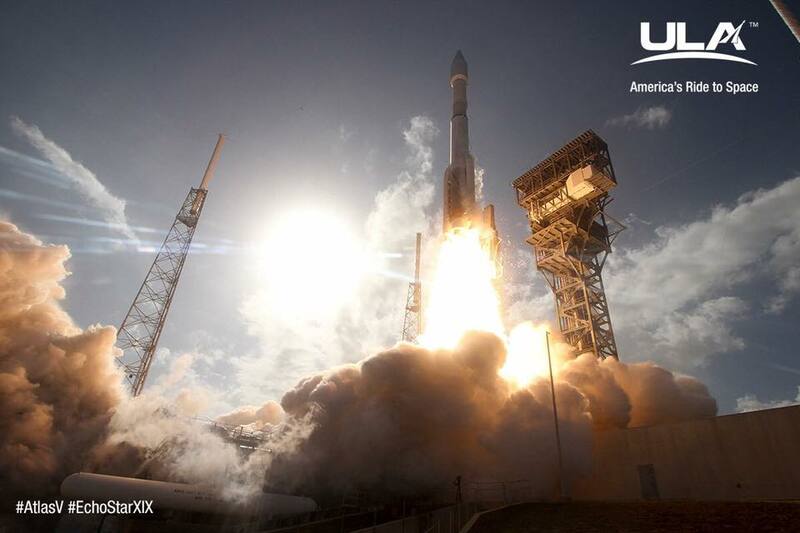 EchoStart 19 launched on December 18th, and has now settled safely into its permanent service orbit. HughesNet launched its 5th generation satellite in December 2016, and revealed in early February 2017 some of the details of the upcoming Gen5 "Jupiter 2" service - which is slated to roll out in April 2017. Unlike HughesNet Gen4, Gen5 will cover the entire continental United States, parts of Alaska and Canada, and even Mexico with faster service than HughesNet has ever been able to offer before. This is a huge improvement over older generations - and suddenly makes HughesNet a lot more interesting for RVers. Gen5 standardizes the speeds to offer a peak of 25Mbps down and 3Mbps up, a substantial improvement that makes HughesNet a lot more competitive with LTE cellular technology. MobileInternetSatellite.com sells Gen3 and Gen4 tripod setups, and will soon offer Gen5. HughesNet will be rolling out Gen5 service starting on April 1st, 2017. Service will require a new HT2000W satellite modem, so anyone with older HughesNet service will require new gear. And do keep in mind - traditionally all HughesNet plans (even upgrades from older service generations) have required agreeing to a multi-year contract to sign up for a new tier of service. Make sure that these new plans will meet your needs before getting locked in! And if you've been contemplating satellite internet service - do not invest in Gen3 or Gen4 service now with Gen5 coming just around the corner! HughesNet has both residential plans (offered directly and via residential resellers like MobileInternetSatellite) and business plans (offered via resellers like RTC). HughesNet plans and prices vary based upon your home address location. The "Ultra" plan shown here is a promotional plan only available in under-utilized spot beams. There are also slower residential Gen3 Spaceway plans at the $49 and $59 tier, with the primary difference being much smaller "Bonus Bytes" allotments that can be used for bulk downloads overnight. The business plans are more expensive, and provide for more usage during the day but less overnight. Spot beam services (like HughesNet Gen3 and Gen4) in the past have never officially supported mobile users. If you try to connect outside your home "spot" the system will ignore you unless your account has been specially provisioned. HughesNet has NEVER directly supported mobile satellite internet installations. This isn't just a matter of policy - it is a technical limitation due to satellite internet dishes needing to be professionally set up and aimed, as well as how the satellite divides up the country into hundreds of "spots" that function similar to cell towers - only a lot further off the ground. Even if you could re-aim a dish that you moved yourself, if you leave the spot beam that your service address is assigned to you will be essentially invisible to the satellite and unable to connect at all. 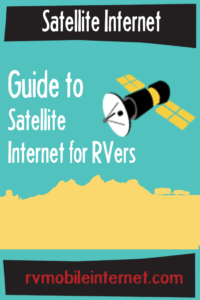 This makes satellite internet service particularly tricky for RVers to take advantage of. There are two ways around this spot beam limitation. 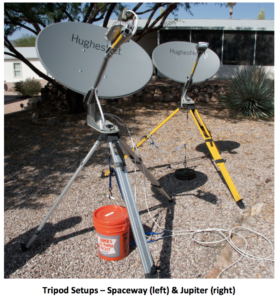 The easiest way to move HughesNet service is working with an authorized HughesNet reseller that is willing to train you how to properly set up the dish on a portable tripod and to aim it yourself. Then whenever you change locations the reseller can call HughesNet's operations center on your behalf to assign you manually to a new service address as if you had moved there and they had performed the "pro" installation for you. This is only practical to do if you move service just two or three times a year - such as seasonal snowbirds moving between a summer and winter home base. 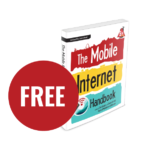 MobileInternetSatellite.com specializes in offering this training and service to RVers - selling full portable tripod kits for taking HughesNet service on the road. To learn more about the benefits and limitations of satellite internet service, read our in-depth guide. If you want to move your service more frequently than a few times a year, things get complicated. To enable true mobility, your account needs to be specifically configured to be able to automatically change spots. HughesNet it seems will NOT be allowing consumer plans to be enabled for this sort of mobile service. But certain business-grade plans being resold and supported by partner companies like RTC WILL be able to be mobile-enabled in the system so that they can automatically roam spots as often as desired. Gen3 and Gen4 business plans have been able to be "mobilized", and Gen5 plans will as well. The exact details of these mobile Gen5 plans have not been fully worked out yet - and the only thing that is certain is that they will cost more than consumer plans, and will very likely offer less monthly data too. The folks at MobileInternetSatellite.com are hoping to be able to offer these truly mobile Gen5 plans to RVers, so if you are interested in this option be sure to get on their mailing list and keep an eye of their forums. Further details will likely be coming within the next month or two. We do not intend to obtain a HughesNet tripod system to test first hand, due to our own lack of storage space for the bulky dish required. But we have owned and used a previous generation (Gen2) HughesNet tripod system, and we are tracking several people who have purchased Gen3 and Gen4 setups and who have shared with us their first hand experiences. Some insider information and tips are shared with our members below. 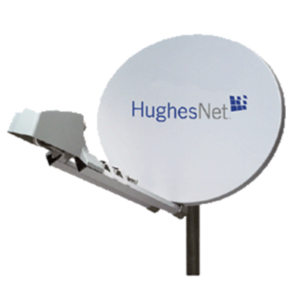 The dish might say "HughesNet" on it, but if you want support in taking the service on the road you will need to purchase through a special reseller. You can NOT sign up for "mobilized" HughesNet service directly with HughesNet, and you can not take an existing residential HughesNet Gen3 or Gen4 system on the road. It just wont work. 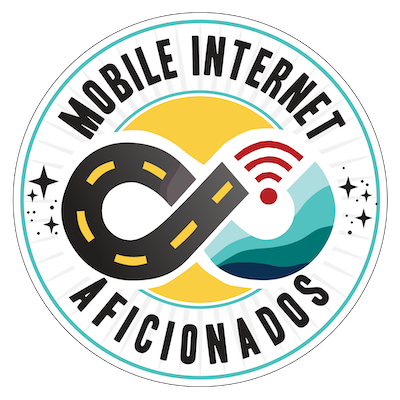 The account needs to be provisioned differently to enable mobility, and the modem needs to have special firmware settings unlocked to make roaming between spot beams possible. 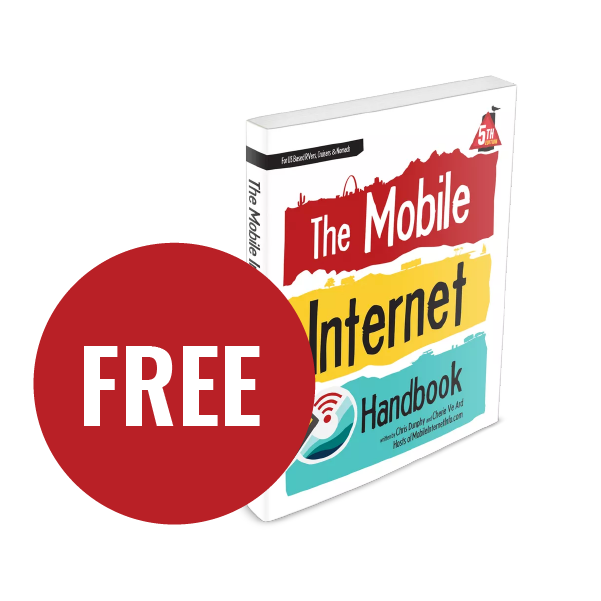 MobileInternetSatellite.com is working to provide RV-centric solutions & support for mobile HughesNet offerings, and is currently the best starting point for any RVer researching getting a HughesNet tripod setup. They have a waiting list you can sign up for to be notified when Gen5 "Jupiter 2" service is rolled out nationwide starting in April 2017. WARNING: Make sure you know what you are buying. 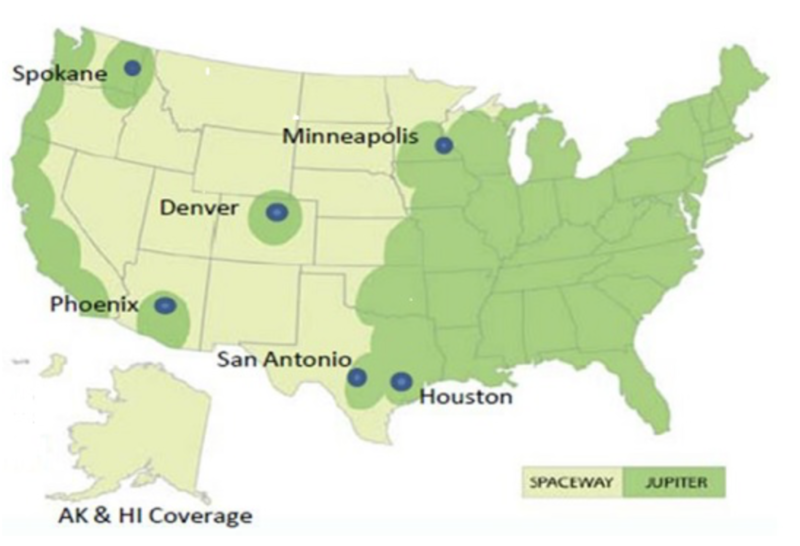 HughesNet Gen3 "Spaceway" service is available with nationwide coverage now, but Gen4 "Jupiter" service is only available in parts of the country and the truly nationwide Gen5 service will only begin to be available starting in April 2017. Gen5 service will require a new HT2000W satellite modem, so anyone with older HughesNet service will require new gear.